When I was little, my brother and I would spend the night with my Granny and Pa Holloway. We loved getting to stay over and always had a good time. Granny would usually cook one of our favorite suppers for us to enjoy...grannies are good like that. After a long day of quilt fort building and games, we'd settle in for the evening for my favorite thing: eating a big pot of popcorn and watching Hee Haw. I wasn't born until 1979, so I only got to enjoy the reruns. I remember my Granny telling me that her Daddy liked to watch it too. Grandpa Wilson (Granny's Daddy) died when I was 2 so I don't really have any memories of him but always loved that I got to enjoy something that I knew he liked too. My Pa liked the show more than my Granny and I always hoped that there would be something funny enough on the show to make him laugh until he lost his breath and slap his knee. He had one of those laughs that would get you tickled too. My favorite memories from Hee Haw are the "Pfft, You Were Gone" song, Archie Campbell telling the story of Rindercella, and Grandpa Jones' supper report. My son enjoys the show too and still asks, "Hey, Grandpa, what's for supper?" Here's a clip I found of Hee Haw's Rindercella over on YouTube if you've never seen it or would like to watch and laugh again. Roy Clark, Minnie Pearl, & Buck Owens will always evoke happy childhood memories for me. My Pa was the official popcorn popper at my grandparent's house. He would take my Granny's big yellow pot (that she still has and I hope to have some day), pour in a little oil, heat it up, and pour in the popcorn. After he put the lid on, we'd all wait to hear that first little pop. 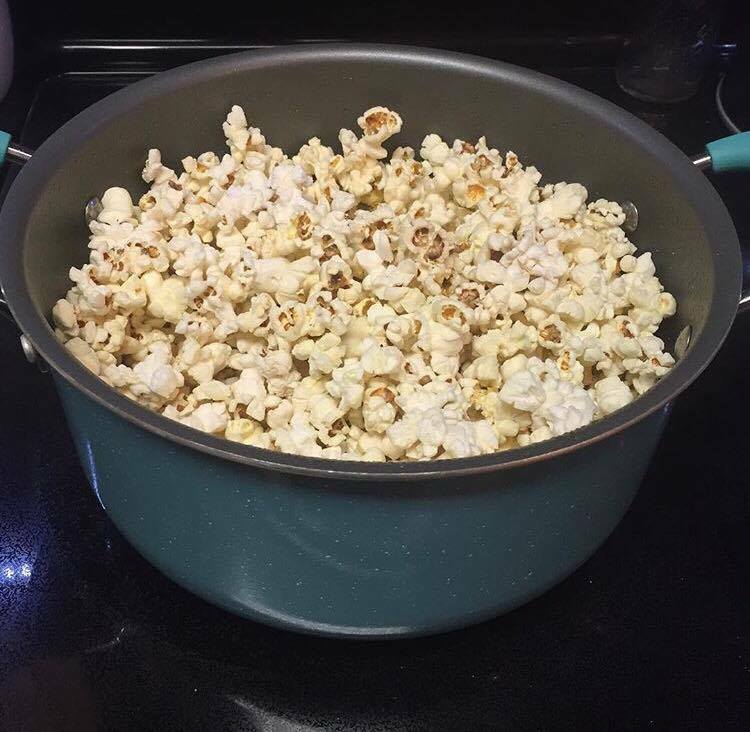 He'd shake the pot around on the stove eye to keep the popcorn from burning and take it off the heat once the popping slowed down. What a treat! 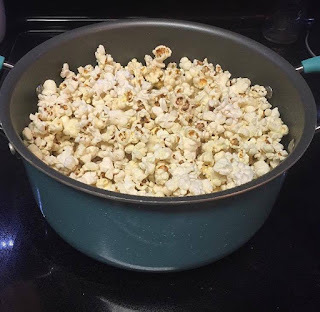 Even when we finally got a microwave, this was and is my favorite way to make popcorn. A couple of nights ago, my little family was watching a movie and I got a craving for popcorn but wanted something salty AND sweet. I decided to whip up a batch of Salted Caramel Popcorn. It's really not a hard recipe to make but will take a little time. Preheat oven to 300*. Add coconut oil to a large pot until there's enough to cover the bottom of your pot. Heat for a few minutes and add popcorn kernels. Place lid on pot and listen for the first kernels to begin popping. Slightly shake the pot back and forth over the stove eye until popping slows down and then remove from heat. I like to look through my popcorn and remove all unpopped seeds once it cools for a few minutes. In a saucepan melt butter, brown sugar, corn syrup and about 1 tsp of sea salt over medium heat. Bring to a boil and boil for 4 minutes without stirring. While your caramel mixture boils, line a large baking sheet with parchment paper or foil. After the 4 minutes, remove from heat, pour, and mix the caramel over the popped corn. Once mixed, pour the covered popcorn onto your lined baking sheet and sprinkle lightly with sea salt. Place sheet in the oven and bake for 30 minutes, stirring the mixture every 10 minutes. Pour mixture onto parchment paper spread out on your counter until cooled. Enjoy! Please let me know if you get a chance to make this delicious sweet and salty snack! I'd also love to hear about any of your favorite memories of Hee Haw or spending the night with your grandparents. You can leave me a message down below in the comments section. And remember, if you ever lall in fove with a prandsome hince, be sure and slop your dripper! This post was originally published here on Appalachian Mountain Roots on 01/04/17.